There is a very young 12 year old Blue Tabby looking for a loving home currently in Essex. Please do visit her details page and give her serious consideration as she does need her own warm lap. and the first Singapura TICA RW Supreme Grand Champion in the UK! Welcome to the Goldlay household. 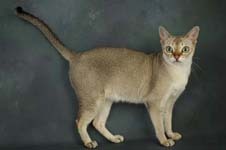 I am Marcia Owen and have been breeding Burmese since 1976. The Birmans joined the household in 1980 and the Singapuras in 1998. We all live in Northamptonshire, England, from where we travel to GCCF and TICA shows on a regular basis. 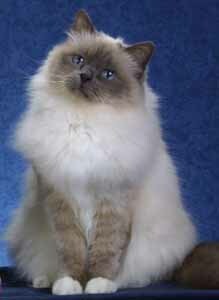 I served on the GCCF Supreme Show Committee and the Birman Cat Club committee for many years. and I have been party to setting up of the Progressive Singapura Cat Club in the UK. To meet the family and to read some breed history, please browse through my pages. Although I only breed a few times a year, I would welcome enquiries from potential homes, for my kittens to consider. Please visit again as I shall be updating this site from time to time. Please visit my kitten page for up to date news of the nursery. Would you like a site of your own?